Every Nigerian with a mobile phone is definitely aware of the unwanted messages received on our mobile phones from time to time, these messages are referred to as SPAM messages and if you happen to be a MTN subscriber, this tip will enable you stop the spam messages from MTN. 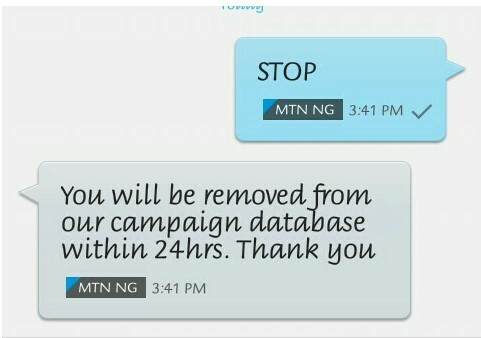 To Stop receiving those annoying and unwanted messages from MTN, simply send STOP to 33111 and await a confirmation message from the network. Got any contribution or question? Kindly share it via comments. Enjoy!